(a) Configuration of sampling site in Flagstaff office 1. This configuration was similar to those set up in all offices. Signs on the wall adjacent to wall sampling plate describe the project, as request that the materials not be touched. (b) Diagram of single sampling plate illustrating nine sampling swatches (circles) of three different materials, one row for tracking equilibrium relative humidity of the materials (Row #1), one row for infrequent sampling (Row #2), and one row for frequent sampling (Row #3). (c) Samples were collected from rows 2 and 3 of all sampling plates from three offices in each of our three cities in four intensive sampling periods over the course of one year. Coloring of sampling swatches in this figure illustrates the change in bacterial Phylogenetic Diversity over the year. From Chase el al, 2016. 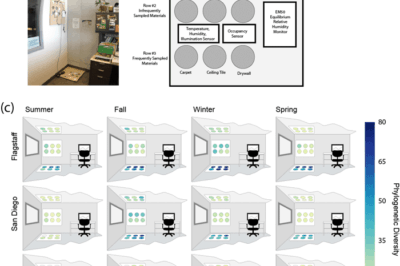 Researchers have determined that geography seems to be the most influential factor in determining what kinds of microbial life would be found in a variety of local office settings.